A long-awaited report from the Government Accountability Office (GAO) says “a pause is needed,” in the Navy’s acquisition of both variants of the littoral combat ship (LCS) until the service proves it has overcome the myriad difficulties it has had fielding the ships and their three proposed mission packages, which allow the ships to act as either minesweepers, sub-hunters, or close-to-shore combatants. Asserting that the Navy will not be able to meet its stated goals of integrating LCS mission packages with the Lockheed Martin Freedom-class and Austal USA Independence-class ships until 2019, the GAO advised the Navy to slow efforts to negotiate a planned 2016 block-buy of 24 ships. “Until the Navy has solidified its requirements and concepts for LCS, neither Congress nor the Navy can be certain that the LCS is the right system to meet the warfighters’ needs. Much is still unknown under the new concept the Navy has set forth. 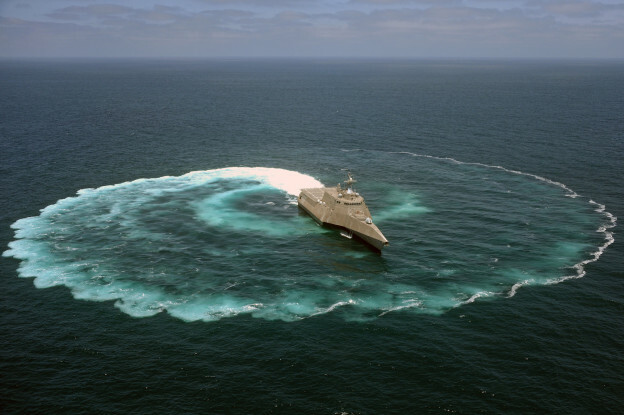 The Navy has a great deal of learning to do about the ships, the integrated capability that they are intended to provide when equipped with the mission modules, and how the overall LCS concept will be implemented,” the report concludes. The GAO cited the creation of a so-called LCS council, and several technical studies commissioned by Chief of Naval Operations Adm. Jonathan Greenert, as evidence the design of the two ships could change to accommodate the additional manning and capabilities the hulls may need to operate effectively, and that moving ahead with an unproven technology could hurt the service. “This disconnect between requirements and acquisitions increases the risk that the Navy is not wisely spending its resources,” GAO says. The Navy largely disagreed with the GAO’s recommendation to limit ships in the planned 2016 block-buy. “The Navy plans to procure LCS in accordance with the most recent long range shipbuilding plans while balancing available funding to achieve the lowest possible pricing for the government,” the Navy response to the report says. The service provided a copy to USNI News. Initial requirements for LCS called for ships that would cost $220 million per vessel, but as requirements for the ships have increased the cost has risen to slightly more than $450 million per ship for each class. In 2010, the Navy announced a block-buy deal between Austal and Lockheed Martin for 20 ships for $8.9 billion. Put into perspective, an Arleigh Burke-class guided missile destroyer can cost up to $1.5 billion per copy. In a Tuesday conference call with reporters, Rear Adm. Thomas Rowden, director of surface warfare for the CNO (N96), defended the Navy’s decision to move ahead with a 2016 block-buy of another 24 ships despite GAO objections. “By sustaining two production lines, the Navy has employed competition in this program to such an extent that it’s the only shipbuilding program—as one of very few defense acquisition programs—where unit cost is on a marked and steady decline,” Rowden said. The Navy also disagreed with a GAO recommendation that the purchase of mission packages be slowed until they’ve been tested further, saying it would still need to acquire mission packages at same rate it would buy LCSs. The Navy also addressed GAO concerns with commonality in the two platforms, saying the issue will be addressed as part of the next block-buy. The planned 2016 deal, “represent the Navy’s first opportunity to specify commonality as part of the acquisition strategy,” Rowden said Tuesday. The release of the report comes ahead of a hearing Thursday (25 July) on the program before the House Armed Services Subcommittee on Seapower and Projection forces. In a final defense during his conference call, Rowden told reporters the LCS program has shared the same difficulties entering the Navy as other ships have. “I don’t think these rough waters are any different from the rough waters from previous ship classes when they were introduced into the fleet,” he said.